You must complete Examity authentication BEFORE starting your quiz or exam. Failing to do so will result in a 0 (zero) score on this quiz. Be prepared to move directly from authenticating your identity in Examity to taking your quiz or exam. You must start this quiz immediately after completing authentication in order to receive credit. Please run an Examity automated systems check before you continue. Clicking on the Start Exam icon will take you to a screen where any scheduled exams will be listed. In the far right column, under Connect to Proctoring, click the green play button to start the authentication and proctoring process. You will see the Welcome to the ID verification process page with a progress indicator (the padlock icon). Note that if you are early to your exam appointment, you may have to wait a few minutes for a proctor to become available. 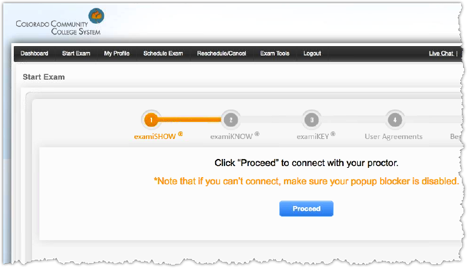 When the proctor is available, you will see a message stating that you can click the Proceed button to connect to the proctor. Next, you will be asked to share your webcam. Click the Share My Webcam button. *** Now the proctor will talk you through the next several steps. *** If there are any differences between these directions and what the proctor requests, please follow the proctor’s instructions. 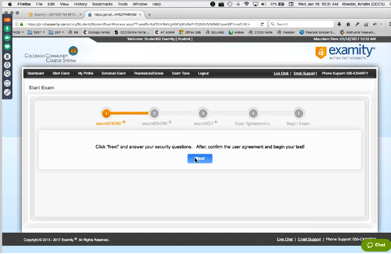 Once the proctor is visible on the GoToMeeting Viewer window, he/she will begin the live authentication process. The proctor will read through the rules and other information regarding the exam and authentication process. When requested, show the photo ID used to create your profile. Keep the online meeting application and exam window open during the entire exam. Windows can be closed only after the exam is submitted. Do not close the Examity GoToMeeting browser window or the exam window until after you receive confirmation your exam was submitted. No talking during the exam. You must remain visible to the webcam the entire time. Your cell phone may ONLY be used for responding to a call back from Examity proctor in case you are disconnected from your proctor during the exam. After reading through the rules, you will be asked to rotate the camera 360° to show the entire desk and workspace. 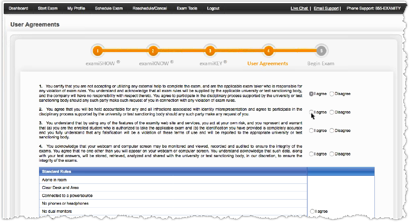 In the next screen, you will click the radio buttons indicating that you agree to the user agreements and exam rules. 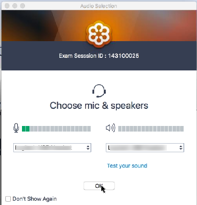 Do not close any of the Examity or GoToMeeting windows until you have successfully submitted your exam. Posted by: Kristin Rivedal - Thu, Jan 19, 2017 at 3:57 PM. This article has been viewed 3007 times.